We can create a professionally produced "slide show" of your photographs. 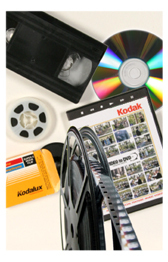 Our qualified technicians will combine your photos, negatives, slides and digital files into a seamless slideshow, each image fading into the next. At your request we add descriptive titles and background music from our library of royalty-free music, then record the completed video production to DVD. Click on the Price Page link for complete details about our DVD Slideshow Service. And please contact us with specific questions regarding your project.